Thank goodness for Temple. She has youtube fu like no one else. She volunteered to help with my Rekha Month video project and just look at the wonder she found. Wow. That is some seriously eye-scarring costuming. Neck to wrist to toe red sparkly fabric with a fringed gold headpiece and bobbed wig - with backup dancers going to a community theater-produced daisy-themed Edwardian-era prom. But wait! There's more! In a transformation that surely speaks to the power of song, Rekha next appears in a completely different look - new clothes, new boots, new makeup, new hair. Not flattering, mind you - she looks like a drag queen. This same film yielded more gold-dipped goodness, complete with ballerina skirt, fingerless gloves, and heeled boots. As Temple said, "It's like Madonna in 'Holiday'!" 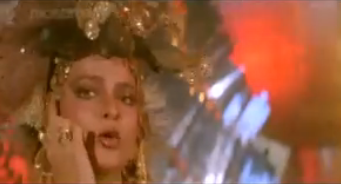 "Pehli Baar Ayi Hoon Main"
There really, really ought to be a Rekha/Madonna mashup project. 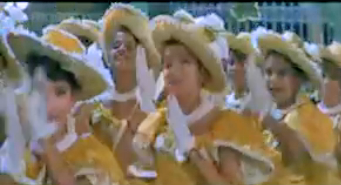 Continuing the wedding theme, the backup dancers in this next song have tulle mini-veils. And Rekha, bless her, gets another golden headpiece! I love the light-up stairs, too, but without a doubt my favorite part is the first few seconds: a Spinal Tap entrance! If you have suggestions for Rekha combinations you'd like me to test, send them in! 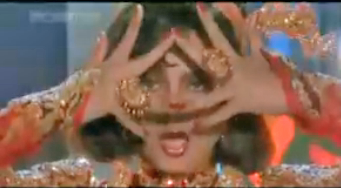 I hope to do at least three more Rekha films this month, but there is always time for youtube fun. She has an obsession with gold, no? All those gold saris she makes her public appearances in. With "Bu le bu I love you" you,ve given me my current favorite song! Thanks!